The development of new protein assays is often hampered by a lack of specific monoclonal antibodies. Their production and validation can easily cost months of work. SIGNATOPE has found a solution to significantly cut down the number of antibodies needed for creating novel protein assays. We have compiled a collection of so-called TXP antibodies (antibodies that recognize terminal sequences of just 4 amino acids in length that are located next to a protease cleavage site). These TXP antibodies bind to all peptide fragments that share a common terminal sequence. The identity of these peptides is then confirmed by their mass which is detected using a mass spectrometer. Our collection of TXP antibodies covers about 6,000 different proteins – so chances are we can set up an assay for your biomarker in much less time if it contains a matching signature epitope. Please contact us – we will check if there is a matching TXP antibody for your marker of interest based on its Uniprot ID or a FASTA sequence file and notify you within 2 working days. To quantify small amounts of protein biomarkers in different species in a single assay, the SIGNAture epiTOPE technology combines immunoenrichment and mass spectrometry. Using special bioinformatics tools, we identify conserved signature epitopes in the amino acid sequences of biomarkers to be analyzed. These short sequences of 4 amino acids flanked by a protease cleavage site are selected to be identical across species and protein isoforms. 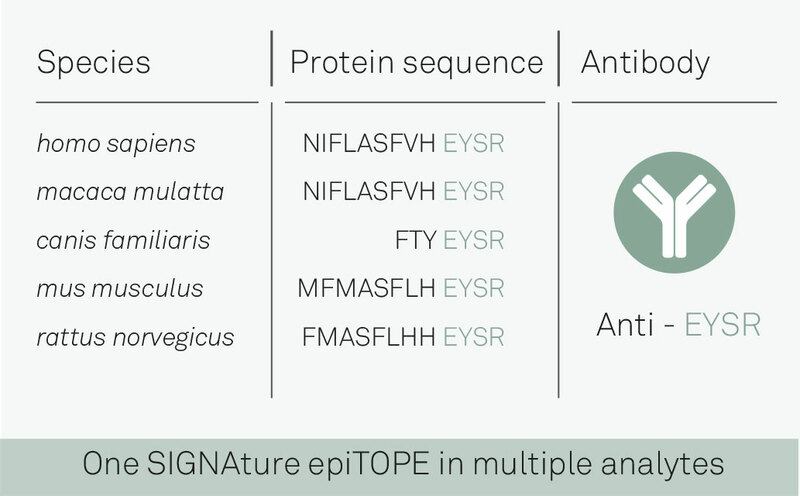 Peptides comprising these signature epitopes serve as surrogates for the biomarkers. enriched up to thousand fold from biological samples by proteolytic treatment, reacting the resulting peptide lysate with antibodies specifically recognizing the tetramer sequences and removing irrelevant peptides. The eluate of the bound fraction are detected by mass spectrometry and precisely quantified by means of isotope-labeled internal reference peptides. These assays enable you to detect a biomarker in several species with just one antibody yielding reproducible data even for notoriously difficult proteins such as drug transporters with unprecedented speed and sensitivity. If our antibody library covers your analyte of interest, the development time for setting-up a custom assay can be as low as 2 months.